Shoes, Shoes, Shoes, I am obsessed! I even have a couple pairs of Heels that are exactly the same but in a different colour! The weather has been so amazing lately, it's time to start bringing out all those pretty sandals, I do love a good wedge. But it still isn't exactly Summer yet and there will be days when you need some comfy Boots. At the moment Evans have a big sale on, up to 50% off! Amazing right? I picked up a pair of Long High Shine Boots in the sale which I am totally in love with. The Heel is about two inches, has super cute detailing on the side and an elasticated panel. They are no longer on the website but you can pick up a similar pair here, the perfect boot for those of us with wider calves. 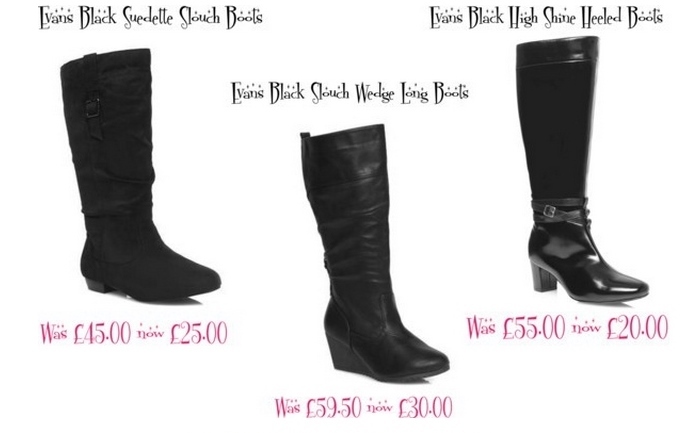 These boots will look absolutely fantastic with the outfit below, creating a casual yet stylish look. All footwear from Evans come in sizes 4-10 in a extra wide fitting and some styles in a wide fit. Here are some more of my favourites. Grab yourself a bargain before they're all gone! Those boots are great! Everyone woman needs at least one pair of sasstastic boots. I can't live without a good pair of boots. They work with just about everything! Love the boots! And it looks like all of Evan's clothing is just as great! I don't own a pair a boots but would love to. Usually I can't find a pair that fits good. I'll have to check these boots out. Oh what a great pair of boots! I need to get a nice pair like that! Those are nice! Ohhh, I love those boots. That is something that I would wear even here in Florida. Love your blog! Oh I love me a good pair of long boots. And all of these look fantastic. Love the discount! Gorgeous boots! I really need a good pair of long boots, but it is so hard to find ones that fit my calves. I love those riding boots!! I have big calves and have the hardest time finding a pari that fits! Thanks for the heads up!! Those are great boots. I have a great friend whom I have known for many years and a few years back he left Scotland to move to England to be with the love of his life. Just so happens she works at Evans. Small world! I am always telling her she needs to mail me a care package. Those boots are hot. I'd love to give them a try! Nice outfit ideas. I can never find high length boots like in the photos that fit me well. I usually struggle to get the boots past my wide calves and whenever I do they tend to cut off my circulation lol. A closet is not complete without a nice pair of boots. ;) I love the necklace too. I would love to have one. Oh I love those boots! I love how sassy a good pair of boots can make me feel! I definitely need a new pair of boots! Those boots look lovely, it's great when I can find something with a wider calf measurement. I'm always wearing boots, they're so comfy.